Does this really comes as a surprise? Not for me, considering that Apple has possibly the most loyal and “die-hard” fans out there. 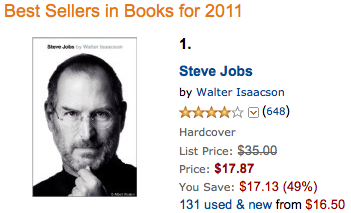 Walter Isaacson’s authorized biography of Steve Jobs has become Amazon’s best-selling title of 2011. The book made its debut on October 24th, and in less than 2 months it has already outsold many popular titles that have been on sale for much longer than this biography. The total sales of the bio have not been released yet, but the book did remarkably well in its first week, selling more than 379,000 copies. Sony Pictures has also bought the movie rights to the authorized biography, and both George Clooney and Noah Wyle are reported to be in the running to portray Steve Jobs. No official word on the film has been released at this time, but we hope that it will be just as good as the book, as Aaron Sorkin is also “strongly considering” writing the screenplay for the film.